"The easternmost town in the USA" is Lubec's claim to fame, but that's not the main reason you come here. Tipping a narrow peninsula jutting into Johnson Bay at the very eastern tip of Downeast Maine (map), Lubec (loo-BEK) is surrounded by water...and wonderful views. The Maine forest comes right to the water's edge, and the changing boreal climate makes for constant, beautiful variety. 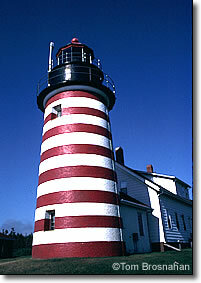 If you need a goal, that would be the iconic West Quoddy Head Light in Quoddy Head State Park, the very symbol of the eastern limit of the USA. 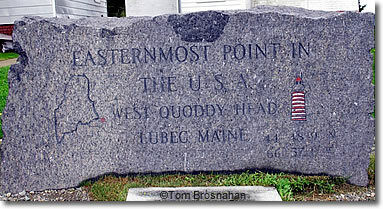 In June, the sun rises a good 25 minutes earlier at Quoddy Head than it does in Boston. Unfortunately, you can't stand at West Quoddy Head Light to see the first rays of the sun strike the soil of the USA because the State Park doesn't open until 9 am in summer. Several captains offer cruises of the bays and islands during the summer months, as well as sea-going whalewatch cruises.